Martha’s Vineyard is justly famous for its abundance of artists, artisans, musicians, authors and designers. These independent craftsmen and women create some of the most amazing and sought after art and products in New England. Vineyard Haven is the heart of the Martha’s Vineyard local shopping scene and on Main Street one of our favorite places to visit is the award winning Night Heron Gallery, a cooperative of 10 local artists and artisans. 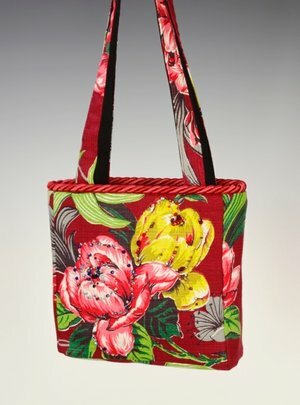 One of their designers, Sylvie Farrington, is a “washashore” all the way from Germany, who designs and creates unique and jaw-droppingly beautiful bags and pillows. Her designs are instantly recognizable and can be spotted all across the US. Over the past 20 years she has built up a reputation as a leader among fashion designers who use the increasingly rare vintage barkcloth as their material. Barkcloth is made from densely woven cotton fibers and was much used between the 1940’s and 1960’s for upholstery and curtain fabrics. Like tree bark, the material has a rough, nubbly texture. Vintage material can be picked up at auction, store closures or at fairs like the Brimfield Antiques Market but is becoming increasingly hard to come by. Sylvie had trained as a seamstress under Martha’s Vineyard designer Michele Ratté in the 1980’s and, after coming across the material at Brimfield on a 1997 visit, Sylvie was inspired to create her first bag. The vintage material designs have allowed Sylvie to create bags and pillows with gorgeous, mid-century design aesthetics and vibrant colors. The scope of her work includes all manner of bags, purses, clutches, décor pillows and backpacks and every design is one of a kind. The eye-catching designs have evolved over time to incorporate funky Swiss Riri zippers, a brand known for their multi-colored teeth, and sparkling Czech beads and crystals. All the bags are custom made and 100% handmade on Martha’s Vineyard by Sylvie and her local team. 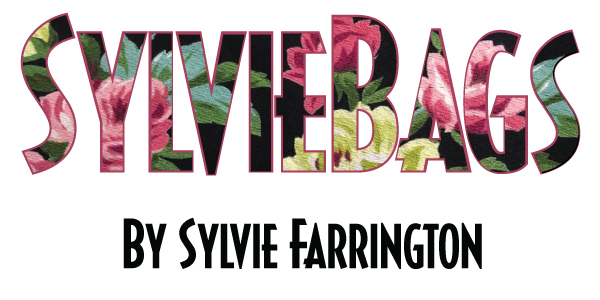 Since day one, Sylvie has utilized Shirley Dewing from Chappy to sew all the linings, pockets and zippers and worked with Elizabeth Greene from West Tisbury for the beadwork. You can see and buy Sylvie’s work via her website (Sylvie Bags), at Night Heron Gallery or at the Martha’s Vineyard Artisans Fair. 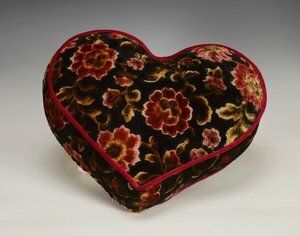 We are also honored and excited that Sylvie has asked us to host the launch of her 2019 Collection of heart pillows at a Pop-Up Trunk Sale at the Nobnocket Boutique Inn. The event will take place on May 10th, 2019 from 4-7pm (free admission). This will be Mother’s Day Weekend so a wonderful opportunity to find a Mother’s Day gift!